A mid-March warm spell is breaking temperature records all over North America and jump starting the summer travel season at Select Registry inns and bed and breakfasts. Leaves are coming out. Tulips are blooming. It even smells like summer. Inns and bed and breakfasts have their fingers crossed for a jump start on the summer travel season as a recent warm spell shatters temperature records across the United States. Chicago broke two daily record-high temperature records in a row this week, reaching the upper 70s at O’Hare International Airport. The National Weather Service forecast for the area has temperatures nearing 80 degrees into next week as well. Carroll said the gorgeous weather is triggering the “summer alert” in travelers’ minds, and his inn is seeing a small surge in bookings for Memorial Day weekend and beyond. The South Hills Golf Club, a stone’s throw from the Sheppard Mansion in Pennsylvania, has been open since early March. Hoar reports that the course has been steadily busy the last few weeks. Last year, the course did not open until April. 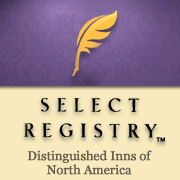 Select Registry™ Distinguished Inns of North America represents nearly 350 of the finest country inns, luxury B&Bs, and unique small hotels across North America — the very best the industry has to offer. Established more than 40 years ago, Select Registry sets the standard for excellence with the longest continuously running inspection program in the B&B industry. Inns applying for membership receive rigorous periodic inspections as do existing member inns. Independent inspectors with years of hospitality experience arrive anonymously, spend the night and evaluate the inn. No other online directory or organization of innkeepers has a comparable inspection program, establishing Select Registry as the benchmark for quality. Each member property is unique and showcased in the Select Registry Guidebook. With more than 400,000 copies available as gifts to guests, the guidebook is the largest publication of its kind in the travel industry. For more information, visit http://www.selectregistry.com.